We are asking all parent of students in grades TK-8 to complete the survey below about their child’s school. The survey is less than 20 questions and should only take a few minutes to complete. The information will help guide the district as it makes plans for the future. The more input we receive, the better, so please take the time to complete the survey ASAP. Thank you in advance for completing the survey and helping provide this important input. 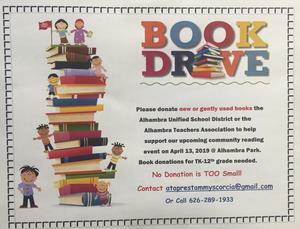 Please donate new or gently used books to Alhambra Unified School District or the Alhambra Teachers Association to help support our upcoming community reading event on April 13, 2019 @ Alhambra Park. Book donations for TK - 12th grade are needed. School Menu Now Posted Online! Kalimba, The Spirit of Earth Wind and Fire and The First Baptist Church of Alhambra are putting together a very special event on December 3rd to support Northrup School. We are looking for volunteers to share their job and/or college experience. Please sign up today! Northrup Family Literacy Night - February 20th @ 6:00 p.m.
Come join us for storytelling fun! Art and Reading! Make and take activities! Learn new strategies for reading you can use with your children! LET'S GET READY TO SPRING INTO READING!